The number of American troops killed in postwar Iraq surpassed the toll of those killed in major combat Tuesday, reaching 140 with the deaths of a soldier in a roadside bombing and another in a traffic accident. When President Bush declared an end to major combat on May 1, the U.S. death toll stood at 138. Since then, 140 more soldiers have died, counting both deaths announced Tuesday. The total number of U.S. soldiers killed since the Iraq war began on March 20 is 278. One of the soldiers killed Tuesday was riding in a support convoy hit by a bomb in the town of Hamariyah, 16 miles northwest of Baghdad, the military announced. Two other soldiers were wounded in that attack. The other U.S. fatality was a soldier who was struck by an Iraqi motorist while changing a flat in a convoy from Tikrit to a forward base, the military said. In another incident, a third soldier was taken to a military hospital with an apparently self-inflicted gunshot wound. Despite the mounting casualties, Mr. Bush on Tuesday told the 85th annual convention of the American Legion, meeting in St. Louis, that the U.S. "will remain on the offensive against terror" in Iraq and elsewhere. "Every nation that stands on the side of freedom and the value of human life must condemn terror and act against the few who destroy the hopes of the many," Mr. Bush told the veterans. Hundreds of U.S. forces launched a series of raids Tuesday to hunt down bandits, gangsters and Saddam Hussein loyalists, capturing at least 24. Belgium is unlikely to send troops to Iraq, even if a new United Nations mandate is passed authorizing wider international participation, Foreign Minister Louis Michel said in comments published Tuesday. Thousands of Shiite Muslims protested peacefully Monday night outside the headquarters of the U.S.-led coalition in Baghdad, charging the occupation force was lax on security and was not doing enough to stop a weekend of ethnic bloodshed in the north and the bombing at the house of an important Muslim Shiite cleric in the south. In Najaf on Monday, mourners buried three guards who were killed in a bomb attack Sunday on the house of Mohammed Saeed al-Hakim, one of Iraq's most important Muslim Shiite clerics. The bomb, a gas cylinder wired to explode, was placed along the outside wall of the house. An investigator with the U.S. Army says his team's work is done at the bombed-out U-N headquarters in Baghdad. While search and rescue missions are complete, U-S troops will continue to provide security. At least 20 people were killed in last Tuesday's bombing. U.S. officials say the Bush administration is encountering resistance after seeking a U.N. resolution to get more countries to send troops to Iraq. As a result, it may not pursue a Security Council resolution after all. Two-dozen suspected Iraqi criminals were swept up Tuesday near Baqouba, 42 miles north of Baghdad, in "Operation Ivy Needle," a campaign launched by the 4th Infantry Division. Hundreds of troops, backed by helicopters, tanks and Bradley fighting vehicles chased a convicted murderer and gangster named Lateef Hamed al-Kubaishat — known as Lateef by U.S. forces, said Col. David Hogg, commander of the 4th Infantry Division's 2nd Brigade. Lateef escaped capture, but the military said it caught seven men it was seeking and seized arms. A later raid on the home of a gunrunner, netted three men after troops surrounded the house. The three suspects tried to flee, with one firing a heavy machine gun, but he was wounded in the leg. "Their primary focus is probably criminal activity, but they have attacked coalition forces through direct and indirect means," Hogg told The Associated Press. "As long as he (Lateef) is in place, we will not be able to establish the conditions for the Iraqi police to establish law and order in the area." The gang claimed responsibility for a bomb that exploded outside police headquarters in Baqouba on Aug. 10, killing one U.S. military policeman, U.S. forces said. Lateef is also accused of selling weapons, burning down the Baqouba courthouse to destroy criminal records, and murdering a prostitute whom he accused of fraternizing with U.S. troops in the area. Lateef was imprisoned and serving multiple life sentences for murder until Saddam granted amnesty to all prisoners in October as the United States ratcheted up its case for invading Iraq, according to U.S. intelligence officers. Ivy Needle was designed to neutralize paramilitary forces, Saddam loyalists, Fedayeen Saddam militia and other subversive elements, said 4th Infantry spokeswoman Maj. Josslyn Aberle. No U.S. soldiers were reported killed or injured in the operations. They consist of "surgical strikes on remote areas throughout the 4th ID area of responsibility, where in the past we haven't had enduring military presence," Aberle said. 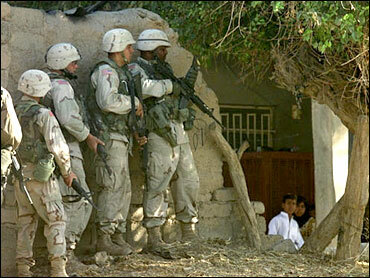 In other raids, U.S. troops detained 22 people in northern and eastern Iraq, Aberle said. Of those, two had been targeted as ex-regime loyalists, five were suspected of planning attacks against coalition forces, and 13 others were arrested for trying to loot the former Iraqi military's ammunition dumps around Tikrit.